Divinity III: Stalinverse made the entire Valiant Universe see red. But not all the heroes of the world turned to the side of Mother Russia: Shadowman took a stand against the red oppressors before all was said and done. But what chance did Jack Boniface and the Dead Side stand against a side complete with armored super soldiers, unkillable assassins and beings with the powers of gods? From new writer Scott Bryan Wilson and the outstanding Robert Gill, we see what happened to New York as the Red Curtain fell. Jack Boniface, aka Shadowman, stood against Russia, but when Bloodshot and X-O Manowar strolled into the states, fighting almost seemed like a moot point. So how did Shadowman go from fighting for freedom to being the soviet’s secret weapon? We find out right here. Also, in a back story, we get to see the origin of another super powered being on the side of Russia as we witness the birth of Baba Yaga. 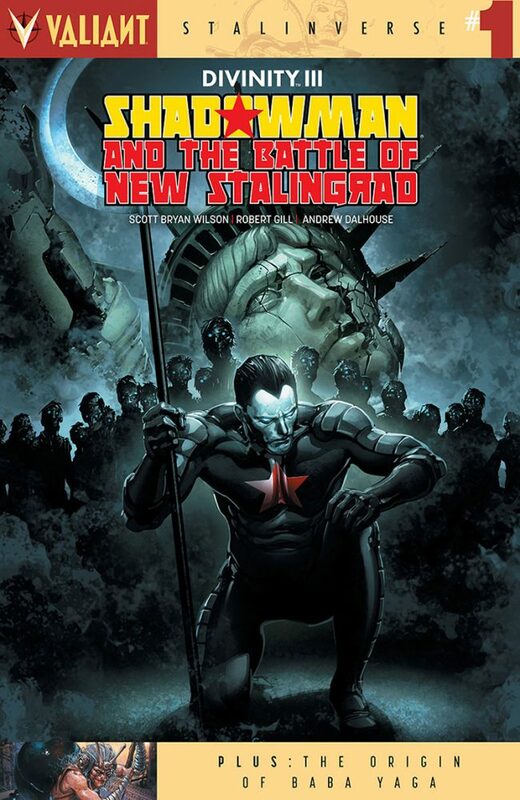 This is an extremely important issue, as it shows us how Shadowman ends up being a pawn for the U.S.S.R., as well as the graphic violence that occurred in the battle for New Stalingrad, aka New York. Wilson writes an excellent tale that highlights Shadowman for the hero he is, and Gill creates the most deserving visuals of this epic issue. The Stalinverse storyline has been on fire as of late, and Shadowman shows no signs of slowing down. This is a superb issue that packs meaning into the overall story, and shows off an epic fight scene as rebels look to hold onto the once great state of New York.